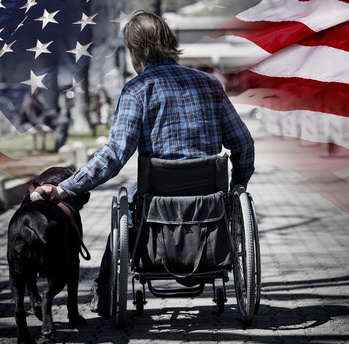 Service dogs can serve in a variety of ways to assist the disabled. The most commonly understood service dog is a dog trained to assist the sight impaired. These dogs are commonly called “seeing eye dogs” or “guide dogs.” Guide dogs help the visually impaired to navigate around obstacles. It is thought that the concept of dogs assisting the sight impaired date back to the mid-16th century was some researchers found references its literature. Schools in which dogs were trained began following World War I. The emphasis in these schools was to assist veterans of the war to become more mobile. In 1929 The Seeing Eye School was founded in Nashville, Tennessee. Today, guide dogs are used around the world. The most popular breed of guide dogs is Labrador Retriever. Another type of service dog is a “hearing dog.” This service dog is trained to alter its owner to sounds which the dog may hear but the owner cannot. These sounds may include alarms, doorbells, phones and buzzards of all types. A “mobility assistance dog” is trained to help a person who has difficulty moving, such as a person who is wheel chair bound. This type of trained service dog may pull a wheel chair, assist a person balancing, pick up things, open and close doors and operate some light switches. Some dogs are trained to respond to a person after that person has had a seizure. These dogs are called “seizure response dog” or simply a “seizure dog.” A seizure dog can be trained to find a person who can assist the person who just had a seizure. The seizure dog can also be trained to turn on an emergency system which can call for help. The dog may wake the person up who just had a seizure. The dog can bring medication to the seizure victim or keep the victim safe until help arrives. behavior which is dangerous or repetitive. The dog can be taught to bring medication. It may be taught to guide the owner through certain situations which may be stressful. A service dog for autism is trained to help a person with autism in several ways. The dog may be trained to alert its owner of an important sound (fire alarm or a smoke alarm) when the autistic person may have difficulty in ordering those sounds from other less important sounds. If an autistic person becomes overstimulated, the dog may reduce that symptom by physical contact with the person. If the person has a poor balance control, the dog may be able to act as a physical support for that person. Similar to a psychiatric service dog, an autism service dog can intervene if the person begins to engage in the self-destructive behavior. One attribute which all service dogs have in common is that they provide companionship and confidence to their owner. The use of a service dog allows the owner to gain independence which he/she might not have had without the dog. A prerequisite to the use of a service dog is the ability of the service dog to be with its owner, not only where the owner lives but also in public. The Americans with Disabilities Act created a legal right to have a service dog with the disabled person anywhere where the public is allowed. The Fair Housing Act mandates that tenants be allowed to have their service dogs with them where the tenant lives even if the housing does not allow pets. The Air Carrier Access Act permits service dogs in the space where the disabled person is on the aircraft. impairment. Having a service dog does not guarantee that a disability application can be won. It is, however, an important fact which must be brought to the attention of the Social Security Administration when a person is seeking Social Security disability.